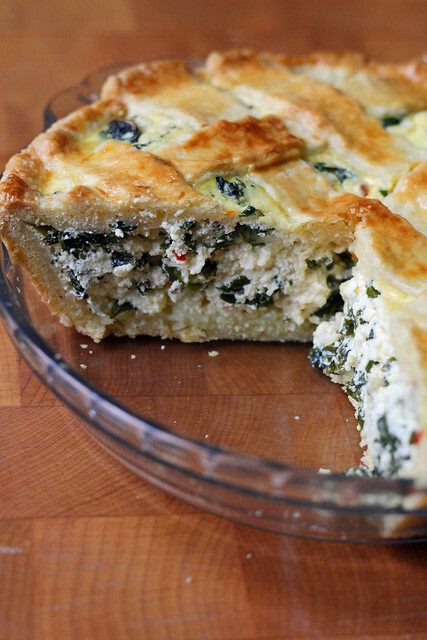 This week TWD is putting on our Easter best with Nick Malgieri’s Pizza Rustica. If you are wondering “what heck kind of pizza is this?” then think instead of cheese pie. Ricotta, mozzarella, pecorino…like calzone filling inside pie crust. This is rich and special…no wonder it is an Italian Easter tradition. The pie dough is a pasta frolla, which is actually a sweet dough, and is used in cookies as well. A sweet dough may sound odd for a savory pie, but with the salty filling, it just works. I should note though, that I cut back the sugar in the recipe from 1/3 cup to 3 tablespoons. For me, this was just the right level of sweetness. The dough also has some baking powder in it, so it puffs a bit and reminded me a little of a biscuit. The pasta frolla is really easy to work with. If you need to patch it while rolling it out, just press it back together. For better browning, you can brush the lattice strips with a little eggwash before baking. At the shop where I work, we make a pizza rustica almost every day. The filling has prosciutto in it and I don’t eat pork, so in the year and a half I’ve been there, I’ve never had a taste! I was really excited to make one at home that I could finally try. This recipe also has prosciutto in the filling, but I think the substitution possibilities are pretty limitless here. In mine, I went with chicken sausage and kale (both of which I cooked and cooled first), and some red pepper flakes for spice. One thing that I’ve learned from making rustica at work is that it’s important to remove any excess liquid from the filling components before assembly. The night before making my PR, I drained my ricotta in a sieve lined with a coffee filter. I also was sure to squeeze any juice out of my cooked kale before chopping it up. I think that pizza rustica is best eaten room temperature. And you know what goes great with it? Red wine. For the recipe, see Baking with Julia by Dorie Greenspan or read Emily’s blog, Capitol Region Dining, and Raelynn’s blog, The Place They Call Home, as they are co-hosting this recipe. Thanks, ladies! There’s also a video of Nick and Julia making the pizza rustica together. Don’t forget to check out the rest of the TWD Blogroll. I agree that this dish accomodates many variations. I don’t eat pork either, so I went with sauteed onions and roast peppers. Your pizza looks delicious. Very pretty! The egg wash was a good idea!!! Your pizza rustica sounds very tasting, I like the kale in it. Love your crust, so shiny! This is a great recipe! Red wine? Interesting! I just enjoyed mine with a hot cup of coffee for breakfast! As always, lovely photos. This is gorgeous! The spinach sounds delicious! OMG! Looks so gorgeous and yummy! WOW. I’ve never thought about doing that before. Must try! Your photography is so ‘spot on’. Belongs in magazines. This pie definitely would stand up to a lot of filling variations. I like. So you’re still at the restaurant? I am so jealous, I am really wishing I would have done the egg wash, it’s beautiful! love the sausage and kale idea…gorgeous! Your filling sounds really delicious! Absolutely beautiful! And chicken sausage with kale sounds divine! Oh wow, nice browning on top! Sounds like you have a great and fun job!! love that you added kale! had to sit this one out-worst cold in a long time kept me out of the kitchen. as one professional baker to another, don’t you love being able to use those work skills at home? i have learned more from trial and error at work than at home! 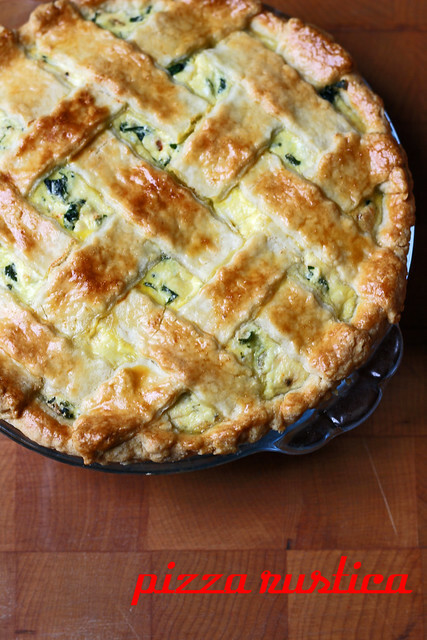 Your photo’s of the pizza rustica are beautiful-nice browning of the lattice. That is one beautiful pie. Could not be more perfect.